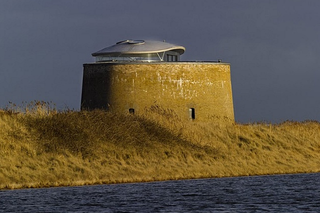 This is a 30-foot-tall Martello Tower in Suffolk, England. It has one door, 13-foot-thick walls, and was built to keep Napoleon out of England. This particular fortress was refurbished with a cushy interior. It's perfect for keeping out nosy do-gooders. I spent a year in negotiation with the farmer. He put in mains water and electricity, but I did have to face up to the fact that the tower was a Scheduled Monument, that it was on the Buildings at Risk register, and that it's part of an Area of Outstanding Natural Beauty that's also a Site of Special Scientific Interest. Given all this, perhaps I should have cut my losses and walked away [...] There are people who say the towers shouldn't become homes because this takes away from their historic role. But if they aren't going to be lived in, what's to happen to them? Those that hadn't been blasted away during target practice by the military have often been left to rot, and then demolished. The tower was abandoned in 1870, but Jackson has turned this 750,000-brick hulk into something livable. Also, if he wants to keep out unwanted solicitors, he just needs to smash the stairs.